Imagine coming home to a house filled with so much smoke that you can barely see across the room. This is the reality for 2.8 billion people around the world who rely on polluting fuels to meet their basic energy needs (WHO IRIS). This is Lhamotso. 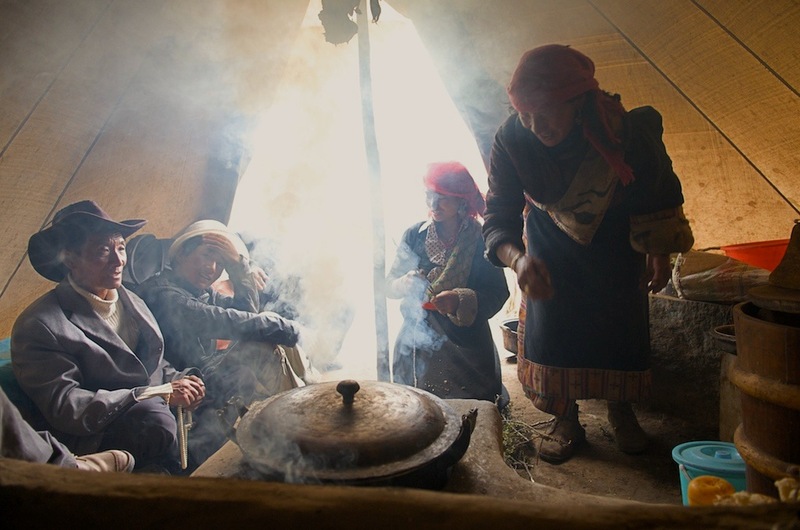 Every time Lhamotso cooks a meal, she puts her family at risk of death and disease. Indeed, in 2012 the World Health Organization identified household air pollution from cooking fires as one of the biggest global health threats, causing 4.3 million premature deaths per year (WHO 2012). See map. Which cooking fuels are polluting and which are clean? Why is cooking with solid fuels so polluting? Pollution is typically worse at high altitudes because the atmosphere has less oxygen. Stove design also affects how much pollution a fire creates by controlling the amount of air reaching the fuel. Learn more about stove design here: Design Principles for Wood Burning Cookstoves. What health problems are caused by cooking with solid fuels? Exposure to smoke from cooking fires is a major risk factor for the most prominent non-communicable diseases, including: stroke, lung cancer, cardiovascular disease, respiratory infections, and chronic obstructive pulmonary disease (WHO Burden of Disease 2014). What are some solutions for reducing smoke from cooking fires? Cleaner fuels and cleaner burning stoves can both reduce smoke from cooking fires. Cleaner fuels include gas, electricity, and solar cooking. Cleaner stoves include a range of improved cookstoves. Our partners at the Global Alliance for Clean Cookstoves and Solar Cookers International have been working tirelessly to bring much needed solutions to the people who need them most. How do SolSource solar cookers help prevent death and disease from cooking fires? SolSource is a line of high-performance solar cookers that helps families cook with solar energy. SolSource solar cookers are 92% energy efficient. The SolSource Classic (1,000 watt) reaches cooking temperatures in seconds and cooks for large families, holding up to 25kg of food at a time. The SolSource Sport (600 watt) folds up into a small carrying case in minutes for easy storage or transport. Our emerging line of add-ons enables families to charge their phones with solar, store solar energy for cooking in their homes or when the sun isn’t shining, and perform basic heating and cooling functions using solar energy. Stay up to date with our non-profit projects, product development and inspirational ideas to live without the means of our One Earth.